As we say in Nova Scotia, "some good"! Sometimes it’s good to surprise yourself. Especially when good means “tasty.” Restaurant tasty. That’s how I would describe this. Not all surprises work out this well. And it was completely without any real forethought at the grocery store. The recipe came about because I changed my mind. Crab “clusters” (legs and body) are on sale this week for 1/3 their normal price at the Superstore. Local corn is also making an appearance (3/$1). With such finds I usually am inspired to make Chinese crab and corn soup. So I bought some with that in mind. But, as I said, by the time dinner rolled around I changed my mind. What I wanted to make had lost all its appeal for some reason. Now there’s nothing wrong with crab and corn chowder, but it’s my stomach and I (too often) listen to what it tells me. Regardless of my stomach's inner voice, I was still stuck with 2 ingredients, crab and corn. Thank goodness for Google’s search function. 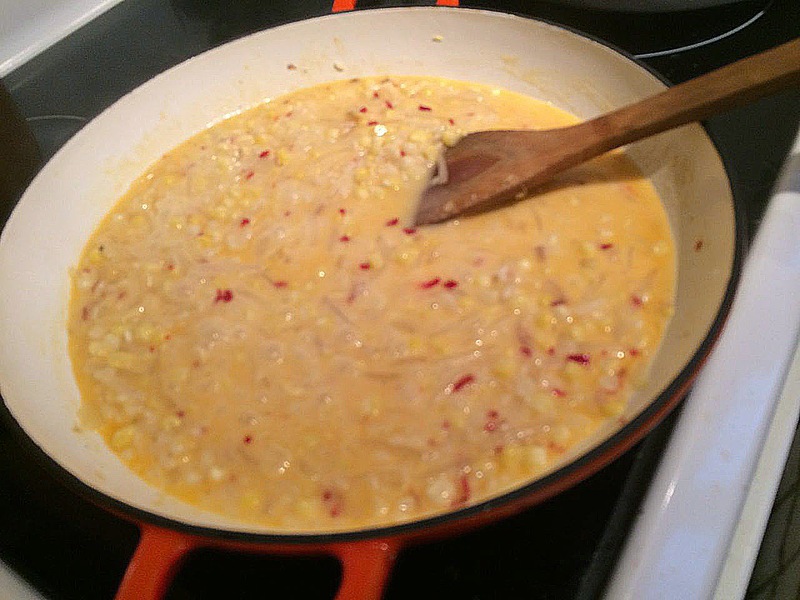 A quick look gave me many hits – mostly for crab and corn soup! 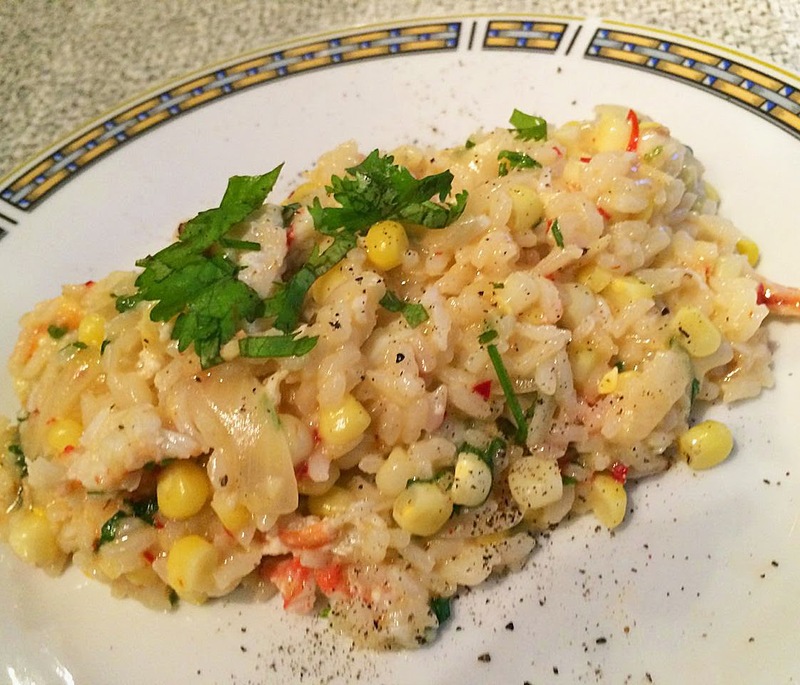 An alternate that stood out was for Italian corn risotto. It sounded pretty interesting. There was no reason I couldn’t add in crab. But Italian and crab really don’t spring to mind as a common combo. Perhaps time for an exercise in fusion cuisine? the contents is covered slightly. So I trekked across the Middle East, over India and into southeast Asia for my flavours: coconut, chilli and ginger. To really get coconut in this I double-dosed it. It’s in both the oil and the braising liquid for the rice. Don't be fooled – coconut oil imparts a coconut taste. Sometimes this is advantageous, sometimes not. This time it helped make everything quite nicely coco-nutty. Clean the pre-cooked crab, if purchasing in clusters, and discard the shells. You should have at least 250 g meat. Combine the coconut milk and stock in a pot and bring to a simmer. Keep warm. 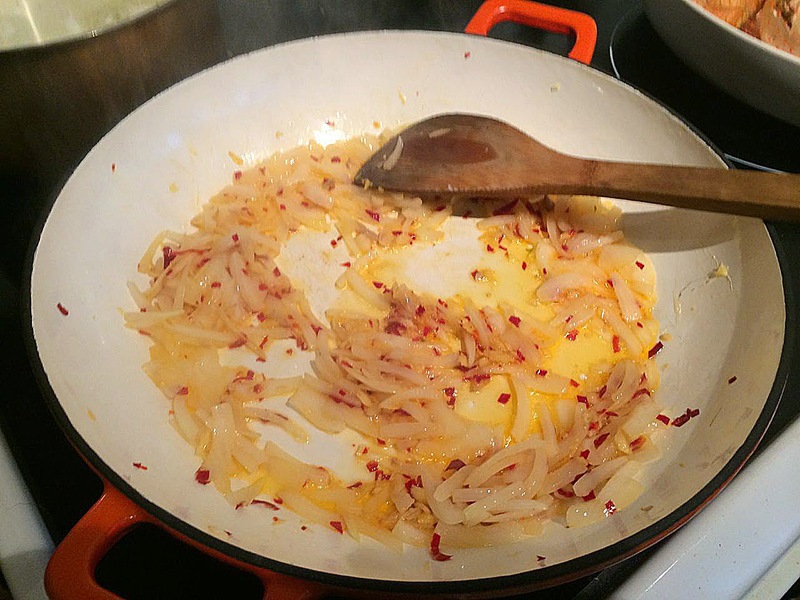 Heat the coconut oil in a wide sauté pan. Add the onion, garlic, ginger and chilli. Sauté until the onion begins to look transparent. Then add the rice and sauté for 2 minutes. Finally add the corn kernels. Reduce heat to medium high. Begin to add the hot liquid to the rice/corn mixture, using just enough to cover. Stir while it cooks. Do NOT go answer the phone or the rice may stick and burn. Add more milk and stock as the liquid is absorbed, stirring. Continue to cook until the rice is “al dente” (still has a slight resistance when bitten). This may take a little less than the 1L or a little more. If you need more liquid, use hot water. be able to drag the spatula across the bottom of the pan and it remains dry. The risotto is dry enough when almost all the liquid is absorbed by the rice. You need to leave some “creaminess” with the rice so it isn’t completely dry. Taste for salt and pepper and adjust. 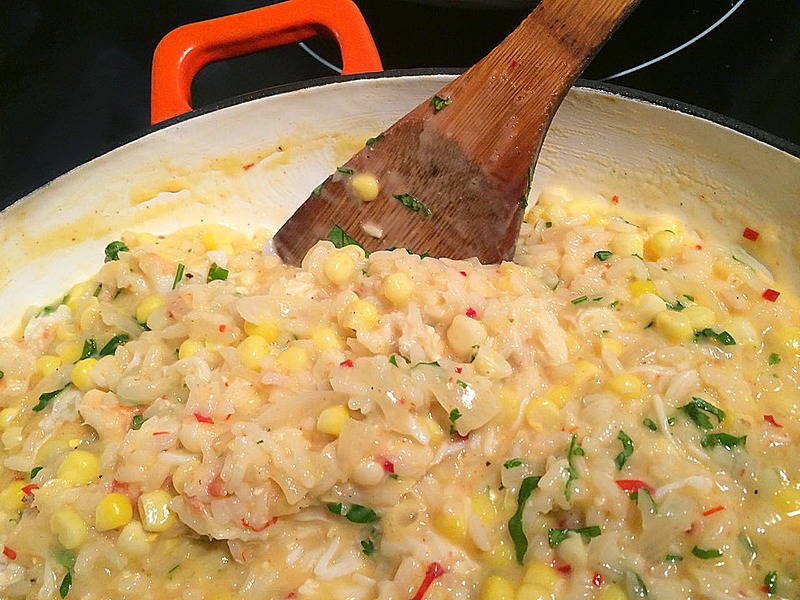 Remove the risotto from the heat and stir in the crab and cilantro. Serve immediately. * You can use canned crab and frozen or canned for kernels, but why would you if fresh is available and affordable? oh yum! thanks for another great recipe! i have your bread rising right now!